A good value cajon that won't let you down. A little limited in sounds. Over the last decade, the cajon has moved from a musical curio to a mainstream percussion instrument. 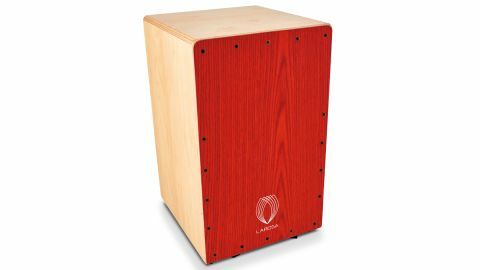 Believed to originate from slaves using packing crates, and carried over from Latin America to Europe in the 1970s, the cajon became adopted in modern flamenco music and thereafter its relative ease of construction and portability meant the cajon rapidly spread from its more traditional heartland into more conventional musical milieus. Its versatility and ability to mimic conventional drumset sounds in box form have meant it has become a staple for the modern drummer, and its portability and low volume has meant it works well in less structured musical situations such as jams and acoustic sessions. La Rosa is a company established in Spain that specialises in producing 'artisanal' modern cajons, and we've been sent its Studio model to test. The Studio model is made of birch ply - 9mm for the body, 6mm for the back and 3.2mm veneered elm for the front striking panel. The body of the studio is finished in a satin natural varnish, with the front panel finished in a phenolic translucent red stain. The corners of the top and sides are immaculately rounded-off to produce a smooth corner which makes it more pleasant to sit on. The back panel has a 5" sound hole about a third of the way from the top edge, and even the sound-hole edges have been rounded and sanded smooth. Inside are two doubled strings taped to the back of the front panel to give the 'snare' sound - these are adjustable for tension using knobs on the underside of the bottom panel. Each cajon sits on rubber feet, isolating them from the floor. The bass tone is full and rounded, seeming almost muted - as if the cajon equivalent of Moongel had been applied.. Strokes at the top of the tapa are short, sharp and tight - again, sounding muted, as if played with a finger on the frontplate whilst striking it. Loosening the snares also broadens the range of available tones, the tapa feels tighter and offers little variety across its face. Lighter strokes are not entirely distinguishable - perhaps as a result of the thin front panel.